Giove in Argo (Jupiter in Argos, HWV A14) is an Italian opera by George Frideric Handel. 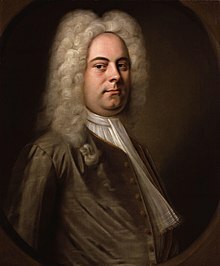 It is one of Handel's three pasticcio works made up of music and arias from his previous operas. The libretto was written by Antonio Maria Lucchini. The opera was first performed at the King's Theatre, Haymarket, London, on 1 May 1739. The libretto by the Venetian poet Lucchini had been written for a setting by Antonio Lotti in Dresden in 1717. Handel might have heard Lotti's opera on his visit to Dresden in 1719, where the famous Senesino sang the part of Jupiter. Probably Handel took a copy of the text to England and remembered it in 1739 when he was looking for a libretto for a short pasticcio opera with three female characters in it. Handel brought several pasticci to the London stage. In most cases he adapted successful works of Italian composers for London, but he wrote three pasticci in which he re-used music from his own earlier works. They are the well known Oreste, the little-known Alessandro Severo and the completely unknown Giove in Argo. In the last-named opera he used, apart from music from his earlier works, some original compositions as well as two arias (sung by Iside) written by the Italian composer Francesco Araja. The opera failed in London and was abandoned after only two performances. For many years most of Giove in Argo was thought to have been lost until some old manuscripts were discovered containing a considerable number of the missing arias. However, most of the recitatives from the original work remain missing. This discovery enabled musicologist and composer John H. Roberts to assemble a performable opera out of the material that was supplemented partly with his own music composed in the style of Handel. A published edition of this score is due soon by the Complete Works Edition,. The first modern performance of Giove in Argo occurred on 15 September 2006 in Bayreuth in the 18th century Margravial Opera House in a complete and staged production by Concert Royal, Cologne and Collegium Cantorum Cologne [de], directed by Igor Folwill and conducted by Thomas Gebhardt. The United States premiere of the work took place on April 29, 2008, in a concert format presented at Carnegie Hall with conductor Robert Bass, the Orchestra of St. Luke's, and the Collegiate Chorale. Rufus Müller sang Giove and Elizabeth Futral portrayed Calisto. The first UK performance since 1739 took place at the Royal College of Music, London, as part of the Handel Festival, on 23 March, 2015. It was conducted by Laurence Cummings. Giove in Argo (Ann Hallenberg, Karina Gauvin, Anicio Zorzi Giustiniani, Vito Priante, Theodora Baka, Johannes Weisser; Il Complesso Barocco; Conductor Alan Curtis) CD 2013. Label: Virgin Classics. George Loomis, "Giove in Argo" – Göttingen International Handel Festival, Financial Times (London), June 1, 2007. Accessed 7 July 2008. This page was last edited on 13 November 2016, at 23:13 (UTC).